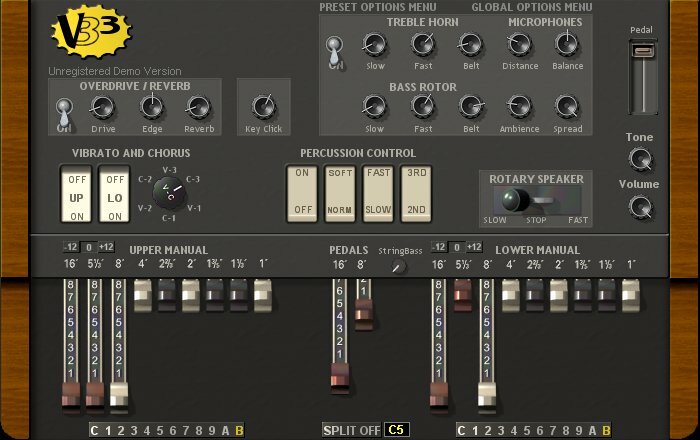 The GSi VB3® is an excellent and cost effective virtual tonewheel organ which simulates with the greatest accuracy the Hammond B3 sound, but it's also capable of two other organ simulations, the Italian transistor organs of the seventies, and the red-tolex organs played by famous pop bands of the sixties.Amongst other valuable features, it has two separate sets of drawbars per each manual. “Inverted Keys” : on the original tone-wheel organ that VB3 emulates, the bottom octave notes have reverse color keys (“inverted keys”) that call up preset sounds. VB3 and separately VB3 Controller mimics this use of note keys to provide the player with presets. “Alternative Presets” : provide 6 banks of 18 presets each (9 for the upper manual drawbars and 9 for the lower manual drawbars). 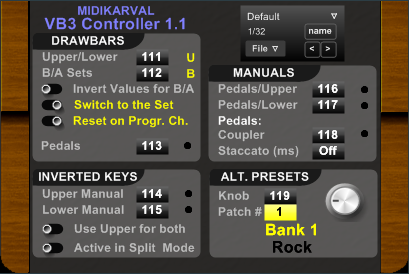 Each preset can be called up by pressing one of the keys (C# to A keys) of your midi keyboard(s) “inverted octave” and shows the relevant drawbar positions on VB3, plus you can also temporarily change these preset drawbar settings. (The bottom C key is cancel sound or mute ). “Programs Section” : you can store your favorite VB3 Controller’s settings in one of the 32 renamable programs for future use. INVERTED KEYS - "USE UPPER FOR BOTH": pressing one of the keys (C# to A keys) of your upper manual's “inverted octave” you can call up the relevant presets (internal or "alternative" presets) of such both manuals’ “inverted key” (this is useful if you want to have consistent presets on both manuals with only one touch). The “Use Upper for both” function doesn’t work with Bb and B “inverted keys”, so you can temporarily change the preset of the upper manual without affecting the sound of the lower one. PEDALS "COUPLER" AND "STACCATO": when the "Pedals/Upper" or "Pedals/Lower" function and the “Coupler” function are active, using the "pedals octaves" of your keyboard you can play in unison the pedals’ sound and the lower manual sound, as many great jazz organists do. Moreover you can choose to make the pedals sound “staccato” (like an upright bass, whilst the "meat of the bass" comes from the lower manual sound). According to Joey DeFrancesco, this is the secret to kicking bass (see Keyboard Magazine, n. 6/1999, page 50). Changing the value in the “Staccato” label you can activate/deactivate the “Staccato” mode and select the relevant length, expressed in milliseconds (from 20 to 400 ms.). Now you can activate/deactivate the VB3 Controller's functions directly clicking on the relevant labels with your mouse's left button (whilst clicking on the labels with the right buttons allows to change the value shown on each label). The demo version is fully functional for 15 minutes. It then expires and you have to remove and re-load it in your host to use it again.